Peter Stuart provided a scan of this document from 1958 which appears to be from a log of memoranda sent out by Scotland Yard. It describes a bank robbery at the Midland Bank in Brentford. Thanks to Keith Davis who identified the perpetrator as Brian Donald Hume. Contemporary accounts found via Google give more detail: the bank was on Boston Manor Road and Hume had chosen the day before the bank holiday closure. He had spent two or three weeks in London preparing for the robbery and was eventually arrested in Switzerland. North London Murders by Geoffrey Howse gives the most detailed account freely accessible, a summary follows: Hume was a secondhand car dealer who had previously murdered his business associate Stanley Setty in 1949 but escaped the death penalty. 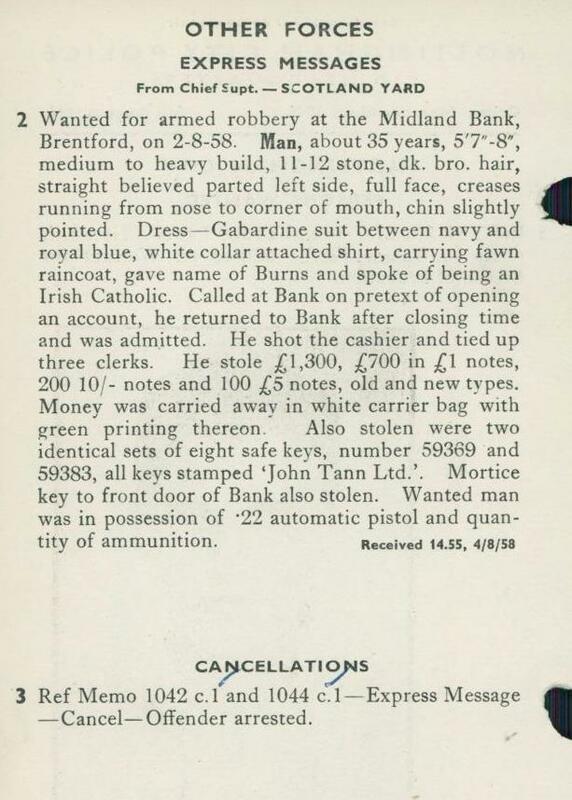 He committed two robberies of Brentford Midland Banks, the first on the 2nd of August as described below, then later a branch on the Great West Road. (Corner of the Beecham's building and Carville Hall Park - FaceBook All things Brentford has some great photos including one of this bank). Hume murdered a taxi driver in Switzerland the following year and was imprisoned, initially there, later in Broadmoor. The cashier who was shot was my father - he still lives in Hounslow, having just turned 90. At the time he was a resident of Harrow. Donald Hume, who was at that time responsible for one murder and was about to commit another in Switzerland, was arrested and locked up in that country. Then he was shipped back to the UK in the late 70s, early 80s. He died after compassionate release and, I think, his body was found on a golf course. Frank Richard Lewis is my father.